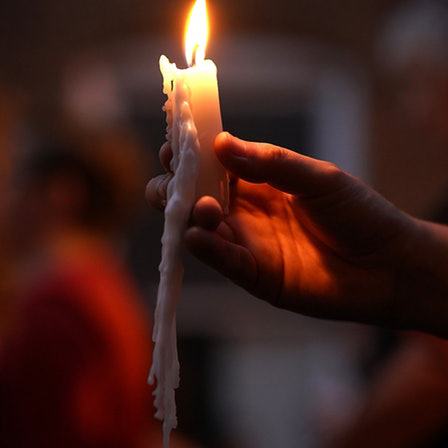 Today, a day of worship for our sisters and brothers in the Jewish community, became a day of mourning when a man entered the Tree of Life Synagogue in Pittsburgh and (while shouting anti-Semitic slurs) murdered 11 people. In the aftermath of the shooting, I reached out to our friends at Central Synagogue and Temple Emanu ‘El. I expressed both our grief for and our solidarity with the Jewish community. I promised Rabbi Buchdahl and Rabbi Davidson that we would begin tomorrow’s worship services with prayers for all who are grieving and trying to make sense of the hateful acts in Pittsburgh. we ask your unfathomable comfort. we ask for a radical change of heart. Our tattered hearts yearn for your blessing. We do not want false comfort God. This problem is too real—too big. We are surrounded by the shards of violence. To get there, we need your blessing. Turn us God. Take your hand and gently turn us. Face us toward the light. Fill us with your vast life-changing love. Help us (all of us) to work together to stop this madness. For the past couple of weeks, I have been engaged in family tree research. I have been studying state and church records regarding births, marriages and deaths. Many of these records are now available through online genealogy sites. Mostly I have focused on my mother’s branch of the family. My mother was the daughter of Dutch farmers who lived in northern New Jersey. In tracing her family back, I quickly discovered something that should have been obvious to me: Every generational step backward doubles the number of ancestors in a person’s family tree. Everybody has four biological grandparents, eight great-grandparents, 16 great-great-grandparents, and so on. I have actually been able to discover a few of my ninth great-grandparents. I say “a few” because we all have 2,048 ninth great-grandparents! In the midst of my genealogical work, I was speaking with my friend Rabbi Josh Davidson about plans for coordinated efforts between our congregations. I asked him if he had ever done this sort of genealogical study. He paused. The Harvard scholar Henry Louis Gates, Jr. points to a similar painful rift in the genealogies of many African Americans because of the scourge of slavery. Gates’ research, on display in his compelling public television show, “Finding Our Roots,” makes it clear that genealogical research and discovery can be both exciting and sobering. There are villains and saints, tragedies and triumphs in everyone’s family tree. It is an emotionally powerful place to go digging. This Sunday — the Day of Pentecost — we will ordain and install officers at Fifth Avenue Presbyterian Church. At 3 pm, we will install the Rev. Werner Ramirez in his position as associate pastor. These two services will have one important thing in common: We will pray and lay hands on the church’s newest officers, and on the church’s newest pastor. The laying on of hands confers, many say, an apostolic blessing. Others believe that it passes God’s spirit along to the next generation of Christian leaders in an unbroken chain leading all the way back to Jesus. Either way, this prayer, this laying on of hands, grafts us into a new genealogy. It is a reminder that we are all related to one other — we are all one — in and through Christ. Come participate in this ancient ritual. Come celebrate our new officers. Come celebrate Werner. Come look at the marvelous genealogy God is crafting in our midst. I am writing to you this morning in the aftermath of the shooting that occurred yesterday at Marjory Stoneman Douglas High School in Parkland, Florida. My heart hurts. Seventeen kids. This cannot be normal. We cannot let this become normal. I wish our politicians would tell us what they were praying. O God, the only true source of wholeness and peace, in a world bearing fresh wounds, we ask for your help and guidance. As we move through this hard time, please endow us with the compassion to embrace our neighbors, the courage to bear one another’s burdens and hearts unafraid to weep with those who weep. As we consider our response to the tragedy in Parkland, Florida, save us from weak resignation, help us start the conversations that will find sensible solutions to gun violence. Help us take positive steps, real steps, bold steps toward preventing future massacres. Fill us this day with the love of Christ, that we might seek good for all people. That we might encourage politicians, principles and teachers, students, police and neighbors to work together to weave a society in which these things never happen. Never. Let us not tire. Do not let us be overcome by evil. Help us overcome evil with good. O Lord, pour a balm on us, help us to heal, for you alone are our refuge and strength, our help in time of trouble. Help us to show in our lives what we proclaim with our lips: Good is stronger than evil; love is stronger than hate; light is stronger than darkness; hope is stronger than despair. Amen. On August nights, I sit on a bench by Ojibway Lake, a mile or so from the Canadian border in northern Minnesota. A soft breeze keeps mosquitoes away. I lean back and look up. The vast, winking dome of the cosmos pulls a single word from me. I cannot help it. Something about being face to face with the stars flips a contemplative switch in me. In late summer, in the northern hemisphere, the closest star (other than the sun) visible to the naked eye is Sirius, the Dog Star. When light leaves Sirius (traveling at 186,000 miles a second) it takes almost nine years (light years) to travel to earth. Other stars are considerably farther away. Rho Cassiopeiae is at least 8,000 light years away. I am looking into the past. Actually I am looking at multiple pasts. Light from a myriad of stars, all at different distances from the earth, is being taken in by my retinas in an instant. For that self-absorbed moment, I am the center of the universe! After all, my mind is organizing all of these stimuli into a single snap-shot. I try to process: the countless stars, the vast distances, the huge spans of time. I am no center. I am an insignificant speck, desperately and futilely trying to make sense of what I am seeing. I cannot even trust my eyes. Staring up, my eyes and my brain are working together to make sense of reality. This is a tricky business, given that my eyes (and your eyes) can only see a fraction of the total radiation/light/energy that is all around us. Our senses are limited. Our bodies are remarkable, but they are not aware of even most of what is going on around us. We are finite. We are also prone to mistakes. Wait, aren’t we the animals who reason? Don’t our rational powers separate us from the rest of the pack? Maybe. But contemporary psychologists like Jonathan Haidt cast doubts on our ability to uncover reality with reason. Ironically, says Haidt, humans typically employ reason to confirm deep-seated intuitions and prejudices. Bring your friends, bring your colleagues, bring your inquiring, hopeful spirit to this journey. Let’s gaze at the stars together. In late November, I hosted a small group of Presbyterian pastors from across the country. We get together once a year to talk about “best practices” and to support each other’s ministries. We often invite an outside expert or two to address our cohort and expand our horizons. This year, Robert Jaeger, President of Partners for Sacred Places, joined us. Headquartered in Philadelphia, Partners for Sacred Places studies the role churches (and other religious congregations) play within their local community. The work of this organization is fascinating. One of the eye-opening studies Jaeger presented involves “the economic halo effect” generated by urban congregations. In 2016, Partners engaged in an in-depth analysis of 90 congregations in Philadelphia, Chicago and Fort Worth. This study (performed together with economists from the University of Pennsylvania) came to the conclusion that every year the average urban church contributes $1.7 million in value to its surrounding community. Large churches contribute considerably more. How did Partners arrive at this figure? the public space the church offers for weekday programs like Alcoholics Anonymous and ESL courses. “Our research,” says Jaeger, “makes it clear that sacred places are an important part of a local economy.” While economic impact probably isn’t the first thing that comes to mind when we think about the value church has for us and for the world, it is eye-opening to have the influence of religious communities described and quantified in this way. If you are curious, I commend to you the full report. This Sunday, my friends, we are going to talk about the many different “halo” effects churches have and we are going to talk about evangelism—our challenge to invite more people to embrace the good news of Jesus Christ in sacred community. What are you thinking? What’s been going through your head the last few minutes? Okay, now a follow-up: Did you decide to think about this subject? Did you intentionally choose to pay attention to some specific thing? Or did it just happen? Did a story on the radio, or a note from your doctor, or an email in your inbox, or a news alert on your smartphone launch your mind on a journey? Do we direct our own thoughts? Or do powerful and random forces blow our thoughts hither and yon like a leaf in the wind? I ask this, good friends, because it is Advent. We are entering the season when Christians prepare ourselves (our homes, our hearts and our minds) for the coming of the Messiah. In this season, we seek to quiet our minds and discipline our thoughts. But it is difficult — very difficult — not to get distracted. I extend the same challenge to you. Keep your O! Fill your hearts and minds with the antiphons this Advent. The clergy and musicians at FAPC have planned a series of beautiful worship services to help you. For this to work, of course, you cannot be passive. For Advent to seep into your soul, you need to control what you are putting into your head. You need to think about what song is on your lips. All this week, I have glanced at the news and then turned away. I heard a segment of an audio recording, a staccato burst–nine bullets a second–before I lunged and switched off the radio. I have avoided watching the police videos. I have tried not to stare at this horrific eclipse. I haven’t wanted to look. At the same time, like most people, I have been searching for answers: “How many people? How many guns? Who is this guy? Why? Why did he do it?” The details coming from Las Vegas are so awful. There must be some key fact that will unlock our understanding. There must be some snippet of backstory that will make sense of all this. Nothing will make sense of this. I start to go numb. I doubt anything will change. This is not the last time we will wake to this story. This is merely the latest in an unstoppable string of blood-splattered encounters. Tortured souls will keep acquiring assault weapons and will keep turning them on innocents. They will. I read a little. I read about the heroes–the nurses and doctors who (like a M.A.S.H. unit) worked like frenzied angels to keep as many people breathing as was humanly possible. I read a little more. I read about the victims. This is slow-going… heart-shredding. I sample one or two stories at a time. A mother, a new husband, a dog-owner, a hair-dresser, a county clerk, a salmon-fisherman, a soldier. The bios of these country-music lovers devastate me. The tributes offered by their family members unspool me. I pray. I weep for the dead. I ask God to do the impossible–to do what only God can do. Precious Lord, hold these people. Hold us all. Walk alongside us through this terrible valley. Steady our steps. Give us hope. Pour your unfathomable peace over our heads like a balm. Save us all from this madness. I get the message. Back to work. There is justice to be done. There is kindness to be loved. P.S. Our preacher this Sunday is FAPC’s beloved friend, Dr. Nora Tubbs Tisdale of Yale Divinity School. Nora will continue our journey through the Book of Revelation by preaching on Revelation, Chapter 6-The Four Horsemen of the Apocalypse. Over the past two days, our Jewish brothers and sisters have been celebrating Rosh Hashanah, the arrival of a New Year. In addition to reading Scriptural texts that recall the goodness of creation and offering prayers for God’s blessing in the year to come, Rosh Hashanah is the occasion when the shofar (a ram’s horn) is sounded during worship services. My friend Rabbi Peter Rubenstein has a wonderful short video that explains the meaning of theshofar and the rich symbolism it contains. This video reminds me that we Christians must share the history of our rituals, too. We must explain, in creative and relevant ways, the meaning of our most basic religious practices, the things that we do over and over again in worship, to our children, to our guests and to each other. You may remember a few years ago when a producer from the reality television show “Keeping Up with the Kardashians” called to see if we would permit the Kardashian sisters to come to worship and be filmed lighting a candle. We asked the woman on the phone: “Why do they want to light a candle?” The producer responded, “It doesn’t matter.” That’s when we graciously ended the conversation. Because it DOES matter! It matters a lot. Human beings crave ritual. We need ritual to mark our passage through life and to focus our attention on the sacred aspects of all that we do. One of the most common rituals we celebrate at FAPC is the singing of the Doxology. It is a powerful moment in the service when we rise to our feet (as we are able) to sing praise to God. This Sunday, we are going to talk about the roots of singing the doxology. We are going to consider why, in a world beset by earthquakes and hurricanes and countless other catastrophes, we ought to have praise on our lips. Hint #1: It is not “all about me.” Hint #2: It has something to do with the shofar! Let’s talk about how the Doxology focuses us, in the face of immense and troubling calamities, on the work we have to do. From the same mouth comes blessing and cursing. Sticks and stones may break my bones, but words will never hurt me. It’s the first rhyme a child learns on the playground. It is a feisty, singsong response to an insult. It is also a big, fat lie. Words hurt. Words demean, threaten and abuse. Words paint twisted pictures of our sisters and brothers. Words fan the flames of anger. Words condone violence. When sticks and stones get picked up, it is usually because of words. My friends, I lament the images emerging from Charlottesville, Virginia. I know you do, too. I condemn the vile words used by white nationalists who marched there this weekend. I know you do, too. The rhetoric of this movement is utterly toxic. It scapegoats the same people fascists always seem to target: Jews and Catholics, African Americans and Latinos, LGBT persons and women. The leaders of this movement cast an ugly vision for our country. The words they use are built on fear, anger and pain. This movement is wrong. It is sinful. It is evil. It must be resisted by people of faith. How should we resist? I suggest we start by cleaning up our language. We, the people of this proud country, have a diminished appreciation for the harmful and hurtful effects of our words. This problem starts at the highest level of national politics and descends all the way to junior high school. Too often our words — important words about vital things — are tossed around with little care for either their truthfulness or their power. We are all paying the price for such brutish communication. Our societal conversation has devolved, it has sunk, into a mean-spirited debate in which no one can agree on the facts, and everyone seems eager to play the victim. There is an alternative. It is rooted in our faith. Now, more than ever, we need words tempered by prayer, spoken in song, and relentlessly doused with love. We need prayer because our hearts need to change. We need to understand and not dismiss the pain and anger in our brothers and sisters. This can only come through hearts opened to the grace of God through prayer. Do not discount time spent with your head bowed. Prayer really can move mountains. Sometimes the mountain is us! We need to sing because this is how people of faith cast a common vision. When we sing the psalms and hymns of our faith, we speak God’s majestic vision, a vision that is welcoming and hopeful and beautiful. We need this vision right now. We need to love because this is the most basic demand Jesus makes of those who would follow him. Without love, we are nothing. Yes, in turbulent times like this, love is challenging. It is also in short supply. Perhaps that is why it is Christ’s supreme commandment. I will be praying for all of you in the days ahead. I will be singing while you are singing this morning. And my heart is full of love for you. I am confident you will make a difference through your caring actions and your mighty words in the days to come. With the promise of hot days, plastic tumblers of iced tea and (I hope) a slower pace comes one of the great pleasures in life: summer reading. This year, the stack I am taking with me on study leave includes serious, prepare-for-the-fall-sermon-series books, but also some fun stuff. Spoiler alert: I have always wanted to preach a sermon series on the last and (some say) scariest book in the Bible: Revelation. This fall — finally — we are going to saddle up and explore the apocalypse. Brian Blount is a marvelous New Testament scholar with an expertise in Revelation. I covet his wisdom for this journey. This mystery novel is getting all the raves. The New York Times says, “This fiendishly brilliant, riveting thriller weaves a classic whodunit worthy of Agatha Christie.” I’m in! I have read the Narnia books so many times. In recent months, though, I have felt it might be time to return to the science fiction novels. Lewis pitched these books to a more mature audience. His protagonist, Elwin Ransom, is trying to figure out why Earth is such a mess. Seems fitting! If you have a book to recommend, I still have room on the stack. Let me know! Like introducing someone to a new friend, there are few things better than the suggestion of a good read.